The beauty is in the details. Part of the 1300 Custom Line series, the VT1300CR Stateline boasts impressive bells and whistles, including a low slung profile with blacked-out fins and sweeping bars. Add to that the raked-out forks and fenders over fat front and rear tires. The styling touches on this touring motorcycle will cause quite the stir. And don’t forget the speedometer – nestled in the gorgeous tank-mounted nacelle, it’s the small details on the Stateline that make it a giant in its class. 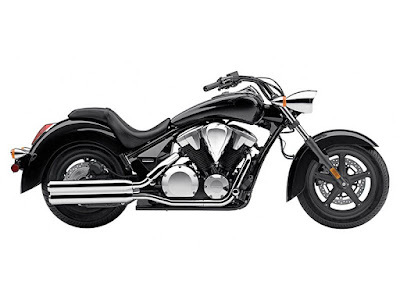 Beyond its progressive styling, the real beauty of Stateline Chopper is beneath the surface with a massive 1312cc 52° V-twin engine with a single-pin crankshaft and dual balancers that deliver plenty of torque and power. The VT1300CR Stateline’s fuel injection system means optimal performance in any condition – from chilly mornings to high altitudes. Even with this much power, this machine can still reel itself in with front and rear disc brakes. With the unique, retro-cool look of a Stateline Custom and the engineering only Honda can deliver – the VT1300CR Stateline is the ultimate package in a chopper bike. Its wide, low tires are the basis for the Stateline’s excellent handling, and they look big and bad too. Plus, silver-finish five-spoke wheels are easy to keep clean and look right on a classic chopper like the Stateline Custom.